Richard Homersham’s engine on work bench support. An Observation by Richard Homersham. For practical purposes the Javelin and Jupiter engines will be termed as the Jowett engine. This detailed procedure has been written to assist those faced with the task of assembling the Jowett engine, but also for those who have little experience with this engine, or those who find that the Maintenance Manual assumes too much knowledge, or those who would benefit by a memory jogger. It is also designed to assist where the engine has ended up with parts that are different from the original assembly. It maps out the steps and practices for not only achieving a smooth and efficient assembly, but also avoiding common and uncommon mistakes, and maximising the likelihood of a successful, reliable, long term operating performance and life, particularly with regard to avoiding future oil leaks. This procedure is based on direct observation, questioning and participation in the assembly of my engine by Mike Allfrey. These Technical Notes have been edited and approved by Mike. 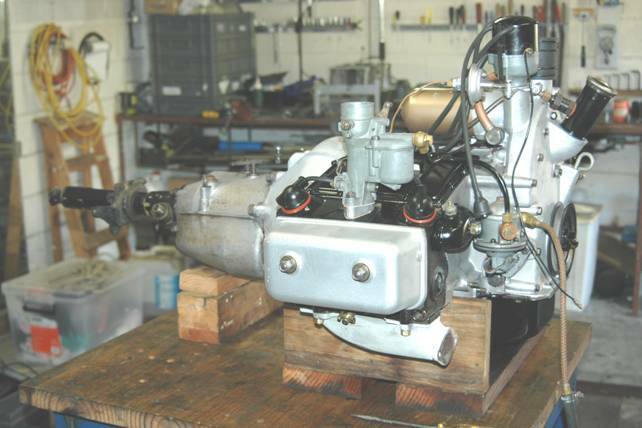 Read this assembly procedure in conjunction with the technical recommendations made in ‘An Introduction to Overhauling the Jowett Javelin/Jupiter Engine’ by Mike Allfrey, 20/3/2002. Particular attention should be paid to improving the oil transfer system, as this is the heart of an engine. All technical modifications were made to my engine, as recommended, and all parts were overhauled. This procedure therefore assumes that all parts being fitted are not worn in any way and offers no advice if they are. These notes have been written assuming that the final document will be placed on Compact Disc. Within the text, reference will be made to other books in the Technical Notes series, which will also be placed on the same disc. A number of topics have been covered in detail and there is no point in repeating techniques again. The terms ‘left’ and ‘right’ apply as viewed from the driver’s seat and looking forward. Threaded studs are screwed into their threads to a torque value that is 20 per cent of that applied to the nut on final assembly. A clean working environment free of dirt and clean parts that are free of rust, oil and dirt are essential, as are a copious supply of clean rags. All re-used hardware should have been wire-brushed, protective coating applied (Inox, WD-40 or such) and stored in labelled, re-sealable plastic bags that are stored in logical groupings, ready for easy location as required. The term ‘wash’ means thorough scrubbing in heavy duty degreasing fluid, rinse with fresh water and blow dry with clean compressed air. It is assumed that all parts have been previously cleaned and stored in a sealed condition. Reference to cleaning and washing here is in addition to this. Check that the flywheel is a snug fit on the crankshaft spigot. Any looseness will result in severe vibration and can cause flywheel fixing bolts to fracture. Some crankshaft re-grinders ‘clean-up’ the oil seal contact area at the back of the crankshaft. This action ruins a good crankshaft. This situation is not a complete loss, the flywheel can be set up in a lathe and be machined at the spigot recess to enlarge it. A ring can be machined and shrunk into the recess to form a new spigot diameter. Balance weights must not be welded to the outside of the clutch pressure plate assembly, lightening drilling method should be used. Welded weights can clash seriously with the inside of the flywheel/clutch housing. Ideally, the front timing cover, crankcase set and the flywheel/clutch cover should be matched sets. The crankcase set numbers should also match. The easy way to establish authentic components is to dry-assemble and check that the sump gasket surfaces of all four components are absolutely flush. · NOTE: When applying a ‘smear’ of Loctite sealant, it means just that – a very thin application of the sealant.. The application should be as even as possible. A feature of Loctite anaerobic sealants is that they only cure in the absence of air. They also ‘grow’ during curing. · Correct size BSF spanners and sockets, and a good quality torque wrench with ½” square drive. 1. Clean up all stud threads using a good quality die nut with cutting compound. Clean up threads with bottoming taps in all castings. If there is any doubt about the structural integrity of the crankcase at stud threads, it would be better to find out now, rather than when components are being assembled. It is a good idea to trial fit and torque the cylinder heads if there is any doubt. If a stud pulls out at this time, it is easily accessed for fitting of a Recoil thread insert. Check that there are no hollows in the cylinder head gasket surfaces. 2. Thoroughly wash and dry the crankcase set. NOTE: Check all gasket surfaces are free of burrs, deep scratches and deformation around studs. Make sure that all gasket surfaces are absolutely flat. 3. Lightly oil the cylinder liner skirts to facilitate easy insertion and withdrawal with respect to the crankcase set. 4. Working on one half of the crankcase at a time, mount it on a wooden surface, with the cylinder head gasket surface uppermost. 5. Carefully check the cylinder liners against each other for skirt length and water jacket length. Cylinder liners may not be of a matched set of four. Check that the crankshaft clearance notches are equal in size. A smaller notch, especially in conjunction with extra machining having taken place, may cause interference between crank throw or connecting rod bolt head and the liner skirts. 6. Fit the liners, less any shims and spacers, into the crankcase half. Line up the head gasket support ledges. 7. Working on one cylinder liner at a time, mount a good quality straight edge across the cylinder head gasket surface and over one of the liners. At four points, measure, with good quality feeler gauges, the distance from the cylinder liner lip and the head gasket surface. Calculate the average dimension for the four measuring points and add 0.006” to 0.008” to calculate the spacer and shim pack required to provide the correct cylinder liner protrusion. 8. Fit each cylinder liner, with the calculated shim packs and verify correct cylinder liner protrusion, using the straight edge across the cylinder liner lip. 9. Number each cylinder liner with white oil based marker pen according to the cylinder numbering sequence on the chassis serial number plate. 10. Install all studs into crankcase set. NOTE: Those studs that screw into threaded holes open to fluids should be installed with Loctite 518 applied to the threads. Those studs that screw into blind holes should have threads coated with Penrite Copper Eze. 11. Mount the RHS crankcase half on the bench. It is a good idea to use an old cylinder head gasket to drill 11 mm diameter holes in the bench top for the head studs to pass through. The crankcase half should then sit firmly on the cylinder head gasket surface. 12. If separate thrust bearing slippers are being used, they should be installed now. The securing screws should have a small droplet of Loctite 272 applied under the countersunk head only – not at the thread. 13. Fit main bearing shells into place over locating dowels. Do this on both halves. 14. Apply a smear of Nulon L90 Xtreme assembly lubricant to the main bearing shells. Place crankshaft into crankcase half that is located on work bench. NOTE: If necessary, install a new spigot bush in the rear of the crankshaft. Soak bush in oil overnight. 15. Push one internal balance pipe seal onto the pipe. Apply a smear of Loctite Blue RTV to the pipe and push fully home onto its seat in the RHS crankcase half. Push second seal so that it just sits on end of internal balance pipe, so that the seal ring will slide down as the upper half of the crankcase is pushed down into its home position. Apply a smear of Loctite Blue RTV sealant. 16. Thoroughly clean joint faces with methylated spirits. At the upper joint face, where the five ¼” bolts pass through, apply a smear of Loctite 518 all the way along upper edge. Do not apply sealant to any other joint faces. NOTE: Application of Loctite 518 to crankcase joint faces will upset crankshaft main bearing clearance, causing low oil pressure indication. 17. Install the crankcase tie bolt nuts, with thread lead facing bolts. 18. Install the two crankcase tie studs. Fit the lower nuts and plain washers. Support the two studs with suitable blocks. 19. Position the LHS crankcase half carefully above the other half, taking particular care where it will meet the internal balance pipe. In a controlled manner, slide the LHS crankcase half down onto its mating surface/ Push it fully home. The seal ring should gently slide into position without being cut. NOTE: Use a pencil torch to observe behaviour of the balance pipe seal as upper half of crankcase is lowered into position. 20. Working quickly, install all crankcase joining hardware. Apply beads of Loctite 518 under the plain washers of the tie bolts, studs and upper five ¼” bolts (under washers at heads and nuts – no spring washers here). 21. Wipe away any sealant that may have squeezed into the camshaft bearing bores. 22. Tighten the tie bolts and studs evenly and tighten to torque value of 75 lb.ft. Fully tighten the upper five bolts. NOTE: All crankcase joint bolts and studs must have good quality plain washers installed. These bolts and studs pass through oil wet areas, the application of Loctite 518 under the plain washers and around the bolt and stud shanks is used to prevent engine oil migration..
23. Use Nyloc self locking nuts at the top five bolts. 24. With a clean rag soaked in methylated spirits, wipe any excess sealant from securing hardware. 25. Using the balance pipe test rig, carry out a vacuum test on the assembled balance pipe. The test rig is shown in detail in the Javelin/Jupiter Maintenance Manual. 26. Seal both ends of the carburettor balance pipe. A foot pump converted at the piston washer is used to create a vacuum at the crankcase breather pipe. 27. A vacuum of 18” hg (mercury) should be held for 10 minutes. If there is a rapid loss of vacuum, this indicates a cut seal – or worse – a pin hole in the balance pipe somewhere. Kerosene can be pumped into the sealed-off pipe and the position of the leak determined. NOTE: A cut seal may not indicate a leak in the pressure test. This test is primarily used to find pin holes in the pipe due to abuse or rust corrosion. Any leakage found at this stage will have to be rectified before proceeding further. 28. Apply Nulon L90 Extreme assembly lubricant to the working surfaces of the camshaft and install it into its bearing bores. 29. Lift the crankcase assembly into a horizontal position. It is a good idea to mount the assembly on a wooden stand that supports it under the water jackets at each side. 30. Measure the cylinder head gasket support and machine it so that it is flush with the cylinder liner lips (i.e. it protrudes 0.006”). NOTE: Consider at the same time, machining a recess in the base of the support to accept an ‘O’ ring to seal the stud from water migration. This will protect the support and stud from corrosion. Apply a smear of grease to the bore of the support housing. 31. With the cylinder liners absolutely clean and using methylated spirits, wipe the seats for the liners in the crankcase. Mount the spacers and shims on to each liner as determined in Step 7. Apply the smallest smear possible to the spacer that will come into contact with the seat in the crankcase. NOTE: If worn cylinder liners are being installed into the crankcase, they should be individually placed in the crankcase from which they were extracted. Once wear has taken place, each liner becomes unique due to the thrust of the power stroke being on the underside on the LH bank, and on the upper side on the RH bank. This fact is most important! 32. Apply a smear of clean engine oil in the crankcase liner bores. Do not oil the cylinder liner skirts and make sure no oil reaches the liner seats. 33. With the cylinder liners in pairs, and the cylinder head gasket support started on the centre stud, slide the two liners into place. Make sure that the clamping ledges are correctly aligned. 34. As soon as the cylinder liners are installed, clamp them into place using suitable plain washers and spacers on four head studs per liner. Tighten the nuts equally. 35. Wash all parts. Carefully inspect the connecting rods, which should have been crack tested. Look for surplus identification marks. These are totally unnecessary. ‘Mechanics’ in the past have been known to identify the connecting rods with their respective cylinders by marking with hacksaw, file or centre punch. Of these, the centre punch is the least harmful to the connecting rod. Jowett Cars Limited, marked each rod and cap with a two-letter code. It is a simple matter to record the letter codes with their respective cylinders for future reference. NOTE: If the connecting rods have been re-identified with hacksaw or file marks (notches), these will have to be linished out and the connecting rods re-equalized. Failure to do this will result in a damaged engine! NOTE: Carefully inspect the connecting rod bolts – replace with new bolts if there is any evidence of ‘necking’, corrosion or abusive damage to the bolt heads. 36. Install one gudgeon pin circlip into one groove in the piston. NOTE: Circlips are manufactured with tapered circlip pliers holes. Install the circlip with the pliers prongs entering the smaller diameter of the holes. This will make circlip removal easier in future. 37. Fit the piston onto the connecting rod by pushing in the gudgeon pin as far as possible by hand. Complete the installation using a suitable aluminium drift. Install the second circlip. Make sure that both circlips are fully ‘seated’ within their grooves. 38. Centre the piston on its pin over the connecting rod and work it to ensure that it is not too tight at the small end bush. 39. Prior to installing the piston rings onto the piston. They should be checked for correct gap dimensions by placing the rings 50 mm in bored cylinder, sitting squarely. The gap can be measured using good quality feeler gauges. This gap should be between 0.007” and 0.015”. 41. For the first type, install first the expander part of the ring set. Then install the bottom scraper ring, the spacer segment and finally the upper scraper ring. The joints of each segment should be spaced equally from each other. Apply copious amounts of clean engine oil while making up the segmented oil control ring. 42. For the second type, the ring should be oiled with clean engine oil and then carefully expanded to just fit over the piston diameter. In cold weather conditions, it is advisable to warm the ring in hot water before installation. 43. The second and first compression rings should be installed. The gaps of all rings should be equally spaced around the piston. 44. Soak the rings in clean oil and fit a good quality piston ring clamp over the rings and tighten firmly. Make sure that the tightening lugs are oriented so that they pass between cylinder head studs. 45. Invert the crankcase assembly on its support stand so that the sump gasket face is uppermost. 46. Lightly oil the cylinder liner bores. 47. Install the big end bearing shell into the connecting rod. 48. Make sure that the cylinder liners are firmly clamped in the crankcase. In addition, check that clamping devices do not interfere with the piston installation process. 49. Make sure that the piston ring clamp is sitting squarely on the cylinder liner lip. Hold the clamp assembly firmly against the cylinder liner lip, while the piston is pushed home into the bore. 50. Apply a smear of Nulon L90 Xtreme assembly lubricant to the crankpin journals and pull the connecting rod squarely onto the journal. Install the connecting rod cap, with identification code s aligned, onto the connecting rod. Wash the connecting rod bolts with Loctite 471 Primer. Allow to dry thoroughly and apply a drop of Loctite 272 Studloc at the female threads. Tighten the connecting rod cap bolts to 35 lb.ft. NOTE: Current pistons supplied by the Jowett Car Club of Australia Inc. have solid skirts. This means that the piston can be installed either war round onto the connecting rod. In the instance where split skirt pistons are being installed, careful note should be made of the word ‘FRONT’ stamped into the top face of the piston. In a horizontally opposed engine, the thrust side is opposite on each bank of cylinders and, great care must be taken during the task of attaching the connecting rods to the pistons. 51. Repeat Steps 36 to 49 for the remaining three cylinders. NOTE: Check that the crankshaft will rotate after installing each connecting rod. If there is ‘lock-up’, then it should be investigated at once. 52. With the crankshaft set in one position, remove the cylinder liner clamping devices. 53. Thoroughly clean the cylinder head gasket contact surfaces. Apply a smear of Loctite 515 Mastergasket only to the water jacket surfaces on the crankcase, and around where the carburettor balance pipe forms a joint, and where the oil feed stud passes through the gasket. 54. Refer to Technical Notes – Cylinder Head Gasket for installation procedure. 55. VERY IMPORTANT: Before installing the cylinder heads, make sure that the coolant water inlets are installed and fully tightened. NOTE: There should be no paint on the elbow faces that contact the gaskets. If paint is left on the flange, the gasket could ‘walk’ out when the nuts are tightened down. 56. Modern cylinder head gaskets feature a small ‘O’ ring that must be installed over the oil feed stud. The purpose of the ‘O’ ring is to prevent oil, under pressure, from migrating into the cooling water. 57. Install coolant drain taps, Tighten without force on tap handle, and using new fibre washers. 59. It is important that the face of each cam follower (tappet) is not corroded or pitted. Damaged cam followers can be refaced by professional repair shops. NOTE: If the push rod seat is a loose fit in the cam follower, thoroughly clean the two components and assemble with Loctite 680 Adhesive. Hold the assembly lightly clamped in soft jaws of a vice until adhesive is fully cured. Wipe off excess adhesive. 60. Apply a smear of Nulon L90 Xtreme assembly lubricant to the cam lobe contact faces of the cam followers. 61. Install cam followers into their bores. 62. Carefully inspect the clearance adjusters for damaged ball ends. Damaged threads and abused jam nuts. The threaded adjusters should be screwed fully home prior to installation into the tappet chest. 63. Insert each pushrod, with a drop of clean oil on the ball to help hold it home in the cam follower socket. 64. Mount a thin 3/8” fibre washer on the oil feed stud. 65. Install the valve rocker shaft assemblies, making sure that the banjo fitting passes over the oil feed stud. As soon as is convenient, install a second fibre washer, good quality plain washer and securing nut at the oil feed stud. Do not tighten this nut yet. 66. Fold the valve rockers back onto their push rod adjusters, and push the rocker shaft assembly home. 67. There are two special spacer washers that keep the rocker gear fastening nuts away from the pivoting rockers. Do not use spring washers at this location – oil will find its way through the split in the spring washer and flood the rocker cavity. NOTE: Use an open end spanner to firmly tighten the nut on the oil feed stud. NOTE: The rocker locating studs must be tightened firmly into the cylinder head. If not, broken studs will be the result. 68. Inspect tappet chest covers for condition, flatten out distortion around fixing screw holes and make sure plug lead supports are in good condition. 69 Install new vent filter felts. 70. Install tappet chest covers, making sure the correct cover is fitted to each side.. The cover with throttle return spring anchor bracket is for the LHS. 71. Clean gasket surfaces with methylated spirits and apply a smear of Loctite 515 Mastergasket sealant to the gasket surfaces. 72. For those machine screws that have threaded holes that break through into oil-wet area, apply Loctite 515 Mastergasket sealant to the screw threads. For those screws that have blind holes, apply Penrite Copper Eze to the threads. Use plain washers under the machine screw heads. 73. Tighten the machine screws progressively from the centre outwards. 74. Wipe away excess sealant with a methylated spirits soaked rag. 75. Carefully install a new oil seal into the flywheel/clutch housing. The seal lip must be parallel with the crankcase joint face. 76. Thoroughly clean with methylated spirits the joint surfaces of the crankcase and the flywheel/clutch housing. 77. Apply a smear of Nulon L90 Xtreme assembly lubricant to the seal running surface at rear of crankshaft. 78. Apply a smear of Loctite 518 Mastergasket to the joint surface of the crankcase. Make sure that the hollow dowels have been installed. 79. Carefully ease the seal lip over the crankshaft and push the housing fully home. Tighten the securing hardware and wipe away any excess sealant that may have appeared. Use correct hardware, otherwise there could be a clash condition with the flywheel. 80. 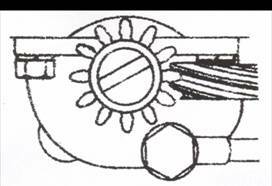 All flywheels have markings for cylinders 1 & 2, and 3 & 4. Later flywheels have an extra marking for the 12 degree before 1 & 2 Top Dead Centre (TDC). For convenience it is a good idea to fill the markings with paint and then wipe away the surplus, so that the punched markings show up easily. It also helps to place a white spot just before 1 & 2 TDC appears. Use white paint for 1 & 2 TDC marking, red paint for 3 & 4 TDC marking and yellow paint for the 12 degrees before TDC marking. 81. Make sure that the flywheel is clean. 82. Check that the flywheel locating dowel is installed in the crankshaft. 83. Install the flywheel carefully, making sure that the dowel enters its hole and not one of the threaded pull off jack bolt holes. 84. Apply Loctite 272 Studloc to the flywheel bolts and tighten to 60 lb.ft. Use a suitably shaped piece of old starter ring gear, meshed with the installed ring gear to form a lock so that bolts can be properly tightened. 85. Screw two setscrews into the front of the camshaft. 86. Using a suitable lever, between the setscrews, rotate the camshaft until number one cylinder’s exhaust valve is in the full open position (cam follower is riding on tip of cam lobe). 87. Mark the front face of the camshaft with a felt marker pen and rotate the camshaft exactly 180° (half a turn) from the full open position. At this point, the cam follower is riding on the heel of the cam lobe. 88. Adjust the push rod so that it can just be spun freely with thumb and forefinger. This provides zero valve tip clearance when engine is cold. 89. Wipe marking off front face of camshaft with methylated spirits dampened cloth. Repeat Steps 87 and 88 for the remaining seven valves. 90. Install new rocker cover gaskets and grommets and install rocker covers to stop dirt ingress. Use old nuts at rocker cover studs. 91. If the oil pump has been modified to increase oil delivery, it should be trial assembled to ensure that the oil delivery pipe banjo bolt can not contact the pump element gears when fully tightened down. If there is interference here, the banjo bolt will have to be shortened. 92. All parts that make up the oil pump assembly must be absolutely clean. Assemble the oil pump, using clean engine oil, make sure that the oil relief valve spool and spring are in good condition. Early oil pump – shim adjustment. The drill should be started slowly, gradually increasing speed to maximum in ‘High’ range, while observing the oil pressure indicated. Care should be taken not to damage the gauge due to previous increased tension on the oil release valve spool spring. While the test rig is running there will be copious jets of oil from the oil pump idler element spindle, and from the delivery elbow. These two jets lubricate the skew drive gear and the timing chain respectively. Both jets must be seen to be working properly – with a constant stream of oil being emitted. It will be observed that, even though there appears to be a vast amount of oil being emitted, it is easily attainable to set the pump to a 60 – 75 psi delivery pressure. NOTE: Do not be tempted to block the nozzle orifices, to increase oil flow to other engine components. Oil starvation at the skew gear set and the timing chain will drastically shorten the effective working life of these components in the front chest. 94. While the engine oil pump is running on the test rig, adjust the oil release valve to provide 60 – 75 psi oil pressure. It does not take much adjustment to change the delivery pressure significantly. 95. While the oil pump is running, check for smooth delivery and reasonably quiet running. 96. Remove the oil pump from the test rig and allow to drain. 97. Install the oil pump drive gear over the key in the front of the crankshaft. Make sure the larger inner radius is facing the front main bearing. 98. Set the crankshaft to top dead centre for cylinders 1 & 2 position (white paint marking). The arrow marking on the flywheel rim should align accurately with the crankcase joint line. 99. Install the engine oil pump on to its two dowels and push fully home. Great care needs to be taken during this operation to make sure that the distributor offset drive is correctly oriented. If the following procedure is not adopted now, the front timing cover and engine sump will have to be removed to effect a change in orientation of the drive dog. NOTE: There are two models of Lucas distributor used on the Jowett engine. The DKY (earlier) and D.M.2 (later) models. Each of these models require a different positioning of the offset drive dog. The two types of distributor are easily recognized. The earlier DKY type has an external vacuum advance mechanism and the whole distributor body can be seen to move as it advances and retards. The later D.M.2 model has an inbuilt advance system with a vernier adjuster nut on the outside. This model has a higher cap assembly. NOTE: As the oil pump is pushed into its home position, the driven gear and spindle assembly will rotate as it meshes with the drive gear. This rotation has to be taken into account. 100. Install the oil delivery pipe. Use a new gasket at the delivery elbow and use locking wire to secure the banjo bolt. Later, larger diameter oil delivery pipes are secured with Allen socket head cap screws. NOTE: The delivery pipe must be installed before the valve timing sprockets and chain are installed. An accurate 360 degree engine timing disc. An accurate dial indicator measuring device with 0.001” graduations on the clock face. The plunger must have more than 0.25” (6.4 mm) of free travel when mounted in position. Both of these items require suitable mounting bracketry and hardware. The need to be mounted on the engine in a manner that instils confidence during the valve timing procedure. 102. If the valve timing is not absolutely correct, the performance of the engine will suffer due to incorrect vacuum characteristics of the air/petrol intake system. 103. It should be noted that the crankshaft sprocket can be installed either way round. The positioning of the keyway in the sprocket bore, in relation to the sprocket chain teeth, is such that half a half tooth radial movement can be achieved by reversing the sprocket on the shaft. 104. Any timing marks that may be found on the timing sprockets should be totally ignored. NOTE: Some crankshaft sprockets have been found with timing marks on both front and rear faces. Such can only add great confusion. 105. Mount an indicator pointer at one of the front timing cover bolt thread holes. 106. Mount the crankshaft sprocket and a new timing chain on the crankshaft nose. NOTE: Use a pair of suitable fibre washers and plain washers to hold the timing disc. 108. Using the flywheel, turn the crankshaft back, so that it is positioned 35° before TDC (1 & 2). 109 Again, using the flywheel, turn the crankshaft forwards until the pointer registers accurately with the 12° before TDC mark on the timing disc. NOTE: Be sure that the disc has not slipped on the crankshaft nose bolt. 110. Set the number one cylinder inlet valve so that there is slight loading of the valve spring. Do not load too heavily, or the retainer cap could clash with the valve guide as the camshaft is rotated. 111. Mount an accurate dial indicator clock to rest on the pushrod end of the number 1 cylinder inlet valve rocker. NOTE: The plunger end of the dial indicator must be longitudinally aligned with the pushrod. It is the actual movement of the push rod that will be measured by the dial indicator. NOTE: The dial indicator plunger should have more than 0.250” of free travel after it is positioned against the rocker arm. 112. With the cam follower set accurately on the heel of the cam lobe, adjust the dial indicator to read exactly zero. 113. Carefully rotate the camshaft, in clockwise direction when viewed from the front, until the dial indicator has shown 0.014” movement (valve lift) at the rocker arm. 114. Hold the camshaft in this position, This position has been determined as the ‘point of valve opening’ by Jowett Cars Limited. 115. The camshaft sprocket can now be inserted into the timing chain. The two sprockets should be offered up to their home positions. There are two holes in the camshaft sprocket for the setscrews to pass through. It is possible to slip the camshaft sprocket in the chain until the two holes are positioned over the threaded holes in the camshaft nose. Without moving the crankshaft, nor the camshaft, the sprocket should be oriented so that the dowel hole in the sprocket aligns with the dowel located in the camshaft without changing position of either shaft. The camshaft sprocket may not align with the dowel, it can be slipped within the chain to achieve alignment. There is also the facility to reverse the sprocket on the crankshaft nose. Care must be taken to ensure that the crankshaft position is held while removing the timing disc to facilitate the changeover. 116. Once accurate dowel alignment has been achieved, push both sprockets fully home. 117. Re-check the 12° before TDC and 0.014” push rod lift settings to ensure that no errant movement has taken place during the installation process. 118. Install the two camshaft securing setscrews, using a new locking plate. 119. Rotate the crankshaft two full turns and check that the 0.014” push rod lift coincides with the 12° position on the timing disc. Use the flywheel rim to rotate the crankshaft. NOTE: Do not hammer the tab over against the setscrew heads. The tabs should be carefully bent against the flat using a pair of suitable vise-grips. 121. It should be noted that the crankshaft sprocket can be installed either way round. The positioning of the keyway in the sprocket bore, in relation to the sprocket chain teeth, is such that half a half tooth radial movement can be achieved by reversing the sprocket on the shaft. 122. Any timing marks that may be found on the timing sprockets should be totally ignored. Early type – simple one position mounting on a fixed position dowel. Later type – a more complex mounting system with a multi-position dowel. 124. The later type, commonly known as the Series III, is described here. To set the valve timing, turn the crankshaft one full revolution so that it is positioned at TDC (1 & 2) again. 125. Mount an indicator pointer at one of the front timing cover bolt thread holes. 126. Mount the crankshaft sprocket and a new timing chain on the crankshaft nose. NOTE: The camshaft timing dowel should be removed from the shaft or sprocket and kept handy for later use in the valve timing procedure.. NOTE: Use a pair of suitable fibre washers and a pair of plain washers to hold the timing disc. 128. Using the flywheel, turn the crankshaft back so that it is positioned 35° before TDC (1 & 2). 129 Again, using the flywheel, turn the crankshaft forwards until the pointer registers accurately with the 12° before TDC mark on the timing disc. 130. Set the number one cylinder inlet valve so that there is slight loading of the valve spring. Do not load too heavily, or the retainer cap could clash with the valve guide as the camshaft is rotated. 131. Mount an accurate dial indicator clock to rest on the pushrod end of the number 1 cylinder inlet valve rocker. 132. With the cam follower set accurately on the heel of the cam lobe, adjust the dial indicator to read zero exactly. 133. Carefully rotate the camshaft, in clockwise direction when viewed from the front, until the dial indicator has shown 0.014” movement (valve lift) at the rocker arm. 134. Hold the camshaft in this position, This position has been determined as the ‘point of valve opening’ by Jowett Cars Limited. 135. The camshaft sprocket can now be inserted into the timing chain. The two sprockets should be offered up to their home positions. There are two large holes in the camshaft sprocket for the setscrews to pass through. It is possible to slip the camshaft sprocket in the chain until the two large holes are positioned over the threaded holes in the camshaft nose. Without moving the crankshaft, nor the camshaft, the sprocket should be oriented so that the dowel can be pushed through the sprocket into one of the camshaft vernier dowel holes without changing position of either shaft. The camshaft sprocket may require rotating 180° within the chain to achieve alignment. There is also the facility to reverse the sprocket on the crankshaft nose. Care must be taken to ensure that the crankshaft position is held while removing the timing disc to facilitate the changeover. 136. Once accurate dowel alignment has been achieved, push both sprockets fully home and install the timing dowel with the peg facing the camshaft. 137. Re-check the 12° before TDC and 0.014” push rod lift settings to ensure that no errant movement has taken place during the installation process. 138. Install the two camshaft securing setscrews, using a new locking plate. The plate should cover the timing dowel. 139. Rotate the crankshaft two full turns and check that the 0.014” push rod lift coincides with the 12° position on the timing disc. Use the flywheel rim to rotate the crankshaft. 141. Remove the valve setting equipment and reset the number one inlet valve as described at Step 88. 142. For detailed instructions for installation of the rear timing cover and its gasket, refer to Technical Notes – Rear Timing Cover Gasket. NOTE: Do not install the engine oil filter element at this stage, refer to Step 154. 143. A new crankshaft seal should be installed in the front timing cover. 144. Early timing covers have no provision for camshaft end-float adjustment. There is a spring loaded plunger located in the camshaft that seats against a wear pad pressed into the timing cover. A sticking plunger can cause a loud camshaft end-float knocking sound. The plunger should be a free fit in the camshaft, and, upon installation should be coated with a smear of Nulon L90 Xtreme assembly lubricant. This lubricant should also be applied to the wear pad in the front timing cover before it is installed. NOTE: If the wear pad is loose in the front timing cover, install it using Loctite 680 Adhesive. Lightly clamp in place and allow to cure. Wipe away any excess adhesive. 145. Later timing covers feature an adjustable peg, that sets camshaft end-float via screw adjustment against a fixed thrust pad pressed into the nose of the camshaft. The adjustable peg should be screwed fully home (forwards) in the front timing cover prior to installing the cover onto the engine. Apply a generous smear of Nulon L90 Xtreme assembly lubricant to the adjustable peg before installing the cover. 146. Once the front timing cover has been installed, screw in the adjustable peg so that it contacts the camshaft nose pad. Apply a small bead of Loctite 518 Mastergasket sealant around the thread of the adjustable peg. Fit the lock nut and unscrew the adjustable peg one-sixth-of-a-turn away from the camshaft and, carefully holding this position, tighten the lock nut against the front timing cover. WARNING: Never attempt to make adjustment of the adjustable peg while the engine is running! 147. Install the oil pressure gauge fitting into the rear timing cover. Use Loctite 469 pipe thread sealant and do not over tighten the taper thread fitting. The aluminium thread boss could split. 148. A new gasket must be used at the front timing cover. If a metal to metal joint is adopted, the distributor drive will be out of alignment. 149. Install the oil filler tube, using a small bead of Loctite Blue RTV sealant. Make sure that the breather valve is correctly oriented so that the copper pipe can be easily connected. 150. The rear dynamo mounting bracket should be installed. Clean the setscrew and crankcase threads with methylated spirits and apply a smear of Loctite 518 Mastergasket to the setscrew thread. This thread breaks through into an oil-wet area, and needs to be sealed. The arm of the bracket should be held at right angles to the crankcase joint line while the setscrew is tightened down. 151. Carefully wash the engine oil sump, inspect and make sure that no baffle spot welds are broken. 152. Check that the oil pump pick-up strainer has 5 – 8 mm clearance to bottom of sump. If necessary, bend the oil suction pipe carefully to achieve the required dimension. 153. Install the horizontal baffle plate assembly. 154. Thoroughly clean the gasket surfaces with methylated spirits and allow to dry. NOTE: It is best to stand the engine assembly on the rear clutch housing face while the oil sump and engine mountings are being fitted. 155. Apply a smear of Loctite 515 Mastergasket to both metal joint faces. Make sure that the sealant is applied evenly and it is continuous inboard of the mounting studs. 156. Fit the engine oil sump, with new washer at drain plug, and install Nyloc nuts at the studs. 157. The four setscrews at the front should be tightened carefully, because there is not a great amount of purchase thread depth in the front timing cover. 158. Wipe away excess sealant. 159. The engine mount bracket assemblies can now be installed. 160. With the engine still in its vertical position, the exhaust manifolds and front cross-over pipe can be easily installed. 161. The exhaust manifolds should be clean, inside and out. If there is an oily carbon residue inside the manifold, it can be cleaned out by burning with an oxy-acetylene torch. This will dry out the carbon deposits and make cleaning easier. 162. The gasket flanges must be flat and clean. The flanges should not be cracked or broken. 163. The studs screwed into the cylinder head should be in sound condition. It is also advisable to use new brass nuts. The original nuts have probably been over tightened and have therefore swollen, making it difficult to have a good spanner fit. 164. Install the manifolds, the single outlet one is fitted to the RHS. Make sure that the gaskets are installed correctly on the cylinder heads. 165. Apply a smear of Loctite JS1 exhaust gasket sealant to the gasket surfaces, and install the two manifolds. Use new brass nuts and new spring washers. Care needs to be taken here – new brass nuts could have been machined from metric hexagon bar, this will require the use of a metric spanner (usually 12 mm). NOTE: Do not over tighten the brass nuts. A brass nut is softer than a normal steel nut and, therefore, deformation of the hexagon can easily result. 166. The front cross-over exhaust pipe can now be installed. Ideally, the centre joint should be a sliding fit, to cope with expansion and contraction with engine temperature change. Use new exhaust flange gaskets and smear exhaust sealant to the gasket surfaces prior to assembling with 8 mm stainless steel fixing hardware. 167. The engine can now be returned to its normal attitude on the bench stand. 168. Identify the LHS and RHS carburettors. 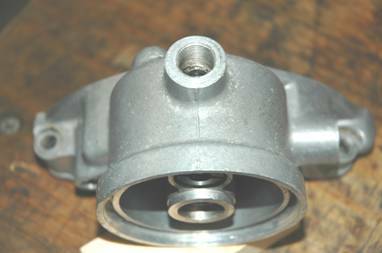 The RHS carburettor has the brass fitting for the vacuum advance pipe and the link from the choke that opens the throttles a small amount when the chokes are actuated. 169. Mount the carburettors on their packing flanges using new gaskets. It is a good idea to force Loctite Blue RTV sealant into any space that could be present between the cylinder head and the sparking plug cover plate. The sealant can be carefully pushed into the gap with a wooden stirring stick, taking care to watch for sharp edges on the plate that could shave the stick. 170. The ball sockets at the ends of the throttle link rod should be clean and lightly oiled. The ball ends on the throttle actuator arms should be round spheres and have no flats. 171. The sliding joint in the throttle link rod assembly must be absolutely free to slide when setting the rod length. The throttle return spring should return the throttle arms positively against their stops. 172. Set the choke control rods so that there is no pulling influence when the chokes are in the open position, the choke control must, however, completely close the chokes when the cable is pulled. NOTE: Having a degree of ‘pull’ at the choke butterfly arms will cause rapid wear at the choke spindles. IMPORTANT! Ensure that a sound, good contact, earth strap is fitted between the engine (at starter mount stud) and the car’s chassis. Failure to do so could result in the choke actuating mechanism carrying most of the electric current while cranking the engine in cold conditions. 173. Install the cross-over petrol pipe assembly, using new washers at the banjo fittings. 174. Install the oil filter element and canister. 175. Set the carburettor adjustments as described in the Maintenance Manual. 176. The fuel pump should have its pressure regulated to 1.5 – 2 psi. The bottom end of the tolerance is the most desirable setting. 177. Lubricate and install the pump actuator rod. Both ends should be in good condition. 178. Make sure that the pump mounting flange is absolutely flat and free from burrs. 179. Apply a smear of Loctite 515 Mastergasket to the gasket surfaces and install the pump. Ensure that the front timing cover gasket protrudes to make contact with the petrol pump gasket. NOTE: Do not over tighten the attaching setscrews, distortion of the flange could result. 180. After allowing gasket sealants to fully cure, checking that the sump drain plug is secure and the engine oil dipstick is clean, fill the sump with new Penrite HPR 30 engine oil to the upper level indicated on the dipstick. 181. Attach a temporary plug to the oil pressure gauge pipe. 182. Make sure that the oil filter drain setscrew is tightened against a new fibre washer. It is a good idea to use a socket (Allen) head setscrew to make use of the drain facility easier. This is particularly so with the later type oil filter assemblies that feature oil cooler attachment fittings. NOTE: This drain setscrew and its length are most important! If the correct length setscrew is not screwed fully home, there is a very likely possibility that there will be no oil pressure on engine start up. The threaded portion of the drain setscrew passes through a ‘drain to sump’ oil gallery opening. 183. Make up a new gasket for the oil filler cap. The gasket can be cut from cork gasket material to a diameter slightly larger than the threaded part of the cap. The gasket will then snap into place within the oil filler cap. 184. Set the crankshaft to TDC (1 & 2) on the compression stroke at number 1 cylinder. That is when both push rods for that cylinder can be easily rotated after setting the crankshaft. 183. Make sure that the circlip securing the drive shaft to the distributor drive dog is secure. 184. Install the distributor, rotate the rotor arm until the drive shaft drops into the offset dog in the oil pump drive spindle. Leave the advance/retard clamp bracket loose and attach it to the timing cover with the spacer washer under the bracket. Use a plain washer, spring washer and nut on the securing stud. Do not tighten. 185. Set up a test lamp and battery with negative lead to the distributor body, and the positive lead to the low tension connection at the distributor. 186. Find a lobe on the distributor cam such that the position of the distributor body allows convenient access for the distributor cap retaining clips, and so that the high tension plug leads are pointing to the rear of the engine. Consideration should also be given to the vacuum pipe connection. 187. The test lamp should glow when the correctly adjusted contact points are closed. Rotate the distributor body clockwise, when viewed from above, until the lamp just extinguishes. Tighten the distributor clamp screw and the mounting bracket nut. 188. Identify the terminal post in the distributor cap to which the rotor arm is pointing to as number 1 cylinder. From here, work around the distributor cap, anticlockwise, and allocate the plug leads in the engine’s firing order – 1, 4, 2, 3. The centre high tension lead connects to the ignition coil. 189. Ensure that the high tension leads are of sufficient length to appear elegant as they pass through the plug lead supports. There should be a degree of useful slack, but not to the extent that fouling with the throttle linkage occurs. 190. Make sure that the vacuum advance/retard pipe is in sound condition and attach it to the RHS carburettor and the diaphragm on the distributor. NOTE: The union nut sizes are SAE and are, 7/16” AF at the carburettor fitting and 3/8” AF at the distributor end fitting. 191. Thoroughly clean the friction faces on the flywheel and the clutch pressure plate. These surfaces must be clean, dry and absolutely oil-free. 192. Identify the ‘X’ stamping on clutch and flywheel. Install the clutch friction disc and pressure plate into the housing. Use a spare gearbox input shaft as a dummy alignment tool..
193. Apply a smear of Nulon L90 Xtreme assembly lubricant into the crankshaft spigot bush. 194. Apply a small amount of Castrol PH Zinc Oxide grease to the clutch friction disc splines. Keep the amount of white grease to a minimum, as excess grease will be thrown onto the friction linings. Grease is required here to ensure clean and efficient clutch operation. 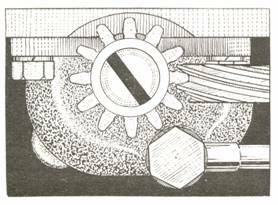 NOTE: Arrange the friction disc so that the raised side of the hub faces rearwards (towards the clutch pressure plate). 195. Align the friction disc with the spigot bush and set the pressure plate over the dowels. Install the six securing setscrews with new spring washers. 196. As the crankshaft is rotated, progressively tighten the six setscrews. 197. Withdraw the clutch friction disc aligning tool. 198. Install the clutch throwout lever pivot ball into its right hand drive position. Apply Castrol PH Zinc Oxide grease to the ball and install the fork and throwout bearing assembly. Apply a minimal smear of white grease at the fork pegs. 199. Hold the fork and throwout bearing assembly while the pivot ball shank is pushed forwards. Still holding the assembly, insert the clutch throwout bell into the rear of the clutch housing, making sure that the notch locates around the pivot ball shank. 200. Thoroughly clean the joint faces at the gearbox to clutch housing joint. Apply a smear of Loctite 518 Mastergasket to one surface. Be careful not to block the breather tract. 201. Ensure that the gearbox is kept in ‘neutral’ and insert the first motion shaft into the clutch friction disc spline. It may be necessary to rotate the gearbox assembly to facilitate spline engagement. Once aligned, push the gearbox fully home and install hardware, Wipe away excess sealant. NOTE: Attempts to engage a gear could dislodge the first motion shaft and require dismantling of the gearbox to reset the third motion shaft spigot bearing. 202. Install the flywheel cover plate. 203. Using a suitable hoist, lift the assembled engine from the work bench and mount it on the engine test stand. 204. Refer to Technical Notes – Water Pump for additional information about overhauling the pump. 205. Install the water pump, using the correct thick-wall hose, and attach the accessory drive belt adjusting bracket assembly.. Carefully install the water pump pulley over its drive key and tighten the new Nyloc nut onto a large diameter plain washer. 206. Install the two fan stay studs into the crankcase. In some cases the holes break through into an oil-wet area and the studs should then be installed with an application of Loctite 515 Mastergasket. The stays, LH and RH should be installed with double spring washers and slotted nuts. Tighten the nuts so that the stay is held firmly, but is free to move. Secure the slotted nuts with new split pins. NOTE: Rubber washers can be used in place of the springs and the slotted nuts can be replaced with thin Nyloc nuts. NOTE: The early style pegs can be cut off the extension housing and exhaust manifold studs threaded into the housing to upgrade the assembly. 208. The threaded cooling fan should be fitted with the thin locking nut screwed onto the fan shaft first. The fan hexagon is then screwed onto the shaft against the thin nut and tightened firmly. NOTE: There should be a minimum gap of 1/32” (0.76 mm) between the nut and the extension housing. 209. Install the starter motor. Attach the earth strap to the lower mounting stud. 210. Install the dynamo. Check that the pulley aligns with the crankshaft pulley. Plain washers at the two lower mount lugs can be used to set the dynamo further forward if necessary. 211. Install the accessory drive belt. Do not over tighten, there should be about ½” of movement in its longest span. NOTE: The setscrew that screws into the upper drive belt tensioner bracket lug on the dynamo is 5/16” UNC SAE thread. 212. The test stand has the facility to install a coolant radiator. The system should be filled with soft water and left for a while to allow water leaks to emerge. Any leaks should be rectified at this time. 213. Connect a well charged 12 volt battery. 214. Connect an accurate engine oil pressure gauge. 215. Using the starter motor, crank the engine (with ignition switched off) until oil pressure is indicated on the gauge. This could take a while because the engine oil filter canister is being filled. NOTE: Check around engine for oil leaks and rectify any that may have presented themselves. 216. Install a set of new Champion L87YC sparking plugs. Use new rubber sealing washers at the plug caps. 217. Provide an adequate supply of fresh petrol. Prime the carburettors. 218. Apply full choke and start the engine. 219. With the engine thoroughly warmed, make tuning adjustments to the carburettors and ignition timing. 220. Switch off engine and allow to stabilize for twenty minutes. 220. Remove the rocker covers and withdraw the valve rocker shaft assemblies. NOTE: Push rods can be wedged into their tubes with clean rag pieces to prevent the cam followers from falling out. 221. Re-torque the cylinder head nuts. 222. Replace the valve rocker shaft assemblies. 223. Adjust the valve tip clearances as described in Steps 85 – 90, once the engine has fully cooled. NOTE: From the point where the valve is fully opened, rotate the crankshaft one full turn to set the cam follower on the absolute heel of the cam lobe. This method may be tedious, but due to the Jowett engine’s horizontally opposed cylinder layout, is very worthwhile. 224. Replace the rocker covers after observing the rate of oil drips from the rocker shaft assemblies. If the drip rate is excessive, the shafts and/or rocker arm bushes will need renewing. Check also for oil leakage at the pipe that feeds the shaft assemblies. The silver solder joints at the banjos have been known to fracture. 225. The engine is now ready for installation into the motor car.